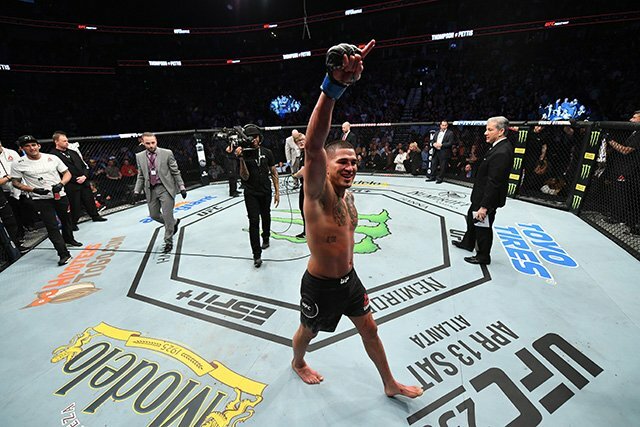 When Anthony Pettis scored an against-the-fence Superman punch knockout against Stephen Thompson in the UFC Fight Night 148 main event on Saturday in Nashville, Tennessee, there was some explaining to do. “Wonderboy” was a heavy favorite for a reason. He has been a perennial contender in the welterweight division for the last four years. Since 2014, he knocked out current middleweight champ Robert Whittaker and former welterweight champ Johny Hendricks, while also winning dominant decisions over divisional luminaries like Rory MacDonald and Jorge Masvidal. He was painfully close to taking the belt off of then-champion Tyron Woodley — twice. Though his previous fight against Darren Till has gone down in the record book as a loss, most people who watched it thought otherwise. Only the best of the best at 170 pounds had been able to beat Thompson, and they just narrowly edged him out on the scorecards when they did. Former lightweight champion Pettis, on the other hand, has been inconsistent in that same timeframe. He lost his title to kick off a three-fight losing skid, then seesawed between wins and losses for the next six fights, going 3-6 between 2015 and 2018. He was finished in each of his last three losses, which up until then had never happened before. By most accounts, it seemed as if Pettis’ time as an elite fighter had come and gone.